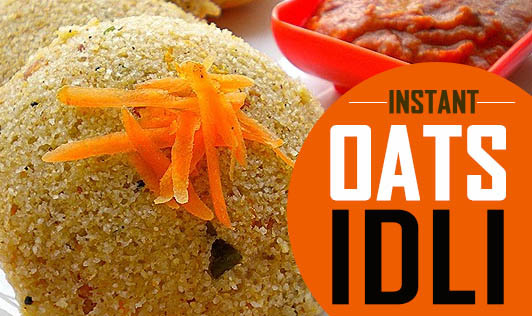 Make your breakfast healthy with these instant fiber rich idlis made with oats and rawa. • Grind ¾ cup oats in a mixer to make oats flour. • Mix oats flour, rava and curd along with ¾ cup of water and keep aside for 30 minutes. • Heat oil in a small non-stick pan and add mustard seeds. • When the seeds splutter, add cumin seeds and asafetida. • Now, quickly pour the batter onto greased idli moulds and steam them for 8-10 minutes till the idlis are cooked. • Once the idlis are slightly cooled, de-mould them and serve hot with chutney or sambhar.